Newspaper stories can be misleading sometimes — especially with respect to real estate. We saw a terrific example of this Wednesday. A “Housing Start” is a privately-owned home on which construction has started and, according to the Commerce Department’s October 2010 data, Housing Starts data dropped by nearly 12 percent as compared to September. The media jumped on the story, and its negative implications for the housing market overall. Although factually correct, the headlines are misleading. Yes, Housing Starts fell sharply in October, but if we strip out the volatile “5 or more units” portion of the data — a grouping that includes apartment buildings and condominiums — Housing Starts only fell 1 percent. That’s a big difference. Especially because most new construction buyers around the country don’t purchase entire condo buildings. They buy single-family residences. As an illustration, 84% of October’s Housing Starts were single-family homes. The remaining starts were multi-units. This is why the headlines don’t tell the whole story. The market that matters most to buyers — the single-family market — gets completely glossed over. The Housing Starts reading wasn’t nearly as awful as the papers would have you believe. 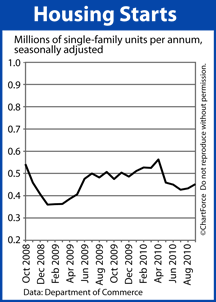 Furthermore, it’s never mentioned that single-family Housing Permits climbed 1 percent last month, either. According to the Census Bureau, 82% of homes start construction within 60 days of permit-issuance. Therefore, we can expect December’s starts to be higher, too. According to the Commerce Department, the number of single-family Housing Starts increased to 452,000 units in September, a 19,000 improvement over August. The government logs each type separately, but also lumps them into a single, comprehensive figure within its reports. For this reason, headlines surrounding the story seem contradictory. It’s single-family homes that most Americans purchase, though, and that’s why single-family starts are the numbers worth watching. As 75% of the market, it’s more relevant than the joint numbers most commonly reported by the press. In September, single-family starts did move to a 5-month high but buyers and sellers should keep the figures in perspective. 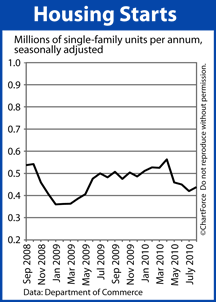 Just because starts are rising doesn’t mean the housing sector has turned around for good. The first reason why is because, in September, starts were 75 percent less as compared to 5 years ago at the peak of housing. And if you feel that’s an unfair comparison, even as compared to the last 12 months, September’s data was tens of thousands below average. Second, September’s Margin of Error happened to exceed its actual measurement. This means that the 4 percent in starts may actually turn out to be a loss of 4 percent (or more!) once the data is collected in full. If there’s a reason to think the New Homes market is coming back, though, it’s that home builder confidence is also at a 5-month high. Foot traffic is rising and builders are optimistic about the next six months. This could mean higher sales prices and less chance for negotiation. Buyers in search of new homes may find it tougher to make a deal the closer we get to 2011. Well, new home sales are not rebounding. Existing home sales are. Go figure. There is enough inventory out there that it doesn’t make financial sense to build new houses if you are building on spec. This is why we are not funding spec construction. Read on….. It may be good news still if you are in the market for a new home to purchase for yourself. From Thanksgiving to New Years is a great time to make offers. Existing Home Sales rebounded last month after a lackluster July. New Home Sales data, by contrast, did not. After an upward revision to July’s data, New Home Sales remained unchanged at 288,000 units in August. It marks the second-lowest number of units sold in a month since 1963, the year government started its record-keeping. 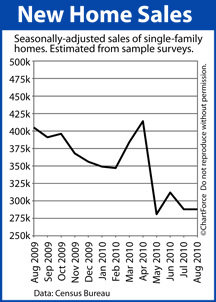 At the current pace of sales, the newly-built home inventory would be depleted in 8.6 months. The August New Home Sales was weaker-than-expected, but both Wall Street investors and Main Street economists are shrugging it off. The numbers were foreshadowed by weakening housing figures from earlier this summer. Together, these three data points suggest that the market for new homes will be soft through at least this month. With New Home Sales fading and colder months ahead, it may be an opportune time for home buyers to look at new construction. Builders are eager to move inventory and the cost of materials remains low. Buying “new” may never be cheaper — especially with mortgage rates as low as they are. The 0.750 percent drop in rates since January has shaved $188 off of a $200,000 mortgage’s monthly cost. That’s $2,250 per year in savings. As home supplies dwindle and mortgage rates rise, finding “great deals” in new construction will undoubtedly get tougher. Take advantage of today’s market conditions, combined with builder pessimism. It may be the right combination at the right time to get that new home for cheap. Now, it’s not that the news is wrong, per se, it’s just not necessarily relevant. Few home buyers are buying multi-family homes or entire apartment complexes. Most buy single-family and, for the first time since April, single-family starts are on the rise — just not by as much as you’d believe from the papers.